Locals who want the freshest Mexican food of any casual Laguna Beach Restaurant go to La Sirena! La Sirena Grill is home to the freshest Mexican Food in town. With two locations in town, it doesn’t matter if you’re in North Laguna or South Laguna, you can probably walk to a La Sirena Grill! If you’re focused on the freshest, best tasting Mexican food, then my favorite place in Laguna is definitely La Sirena Grill! This hidden treasure is worth finding. Slightly off of the beaten path, but well worth it! Located on Mermaid in downtown North Laguna. Limited sidewalk and barstool seating Located in the Aliso Creek Shopping Center, across from the Montage Resort in South Laguna Beach, Ca. Relax with a taco and cold beer after a day at the beach. Dine-in as well as take-out are available with seating both inside and out. 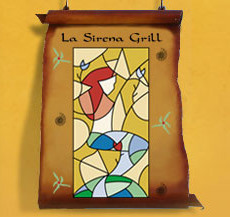 Share Your La Sirena Grill Experience! Do you have a great story, photos, or experience from La Sirena Grill? Share your review and/or pictures from this Laguna Beach restaurant!